Bad Mojo's original publicity spin asked players to imagine Myst, directed by David Lynch and scripted by Franz Kafka. While arresting, the blurb is more than a bit misleading. Players expecting a creepy/weird point-and-click, first-person experience a la Myst found instead a creepy/weird third-person (or should that be third-roach?) adventure driven by nothing but the cursor keys. Spin aside, for those with a taste for the creepy/weird and a willingness to see through the grime of the world into the heart of the spirit, Bad Mojo is an extraordinary adventure. The Roach Game, as it became known, embodies what Drew Huffman, Pulse Entertainment's founder and president, calls the "Booger Principle": something really disgusting will attract and hold lots of attention without generating too much backlash. It worked. 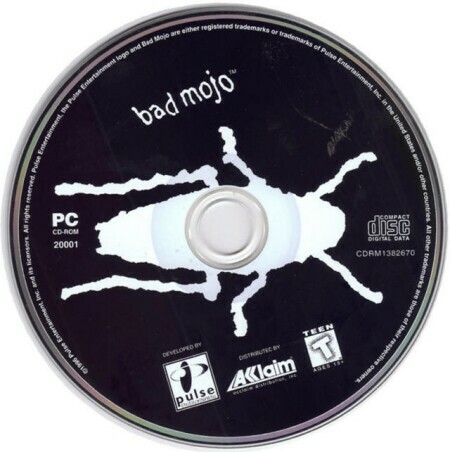 I remember picking up my copy of Bad Mojo back when it was first released in 1996. It was given a full end-of-rack display ... and there were even Bad Mojo gimme caps! Bad Mojo wore its disgustingness like a yellow plaid sports coat, daring players to confront all that crawls in the walls and sewer pipes (and kitchens!) of all the seedy bars in all the seedy neighborhoods in all the cities of the world. Bad Mojo begins in a bank of moonlit clouds. There is a crack of thunder. A noirish voiceover begins as the camera sweeps down past a bridge, then into a rundown riverside neighborhood and finally through the upstairs window of Eddie's Bar: "All my life I've felt helpless, cheated, stepped on. I was always the little man, the square peg, the forgotten one. So I decided to do something about it." The voice belongs to Roger Samms, an unhinged entomologist who specializes in developing new ways to exterminate one of the world's oldest life forms: roaches. He's gotten his hands on enough money to live the good life in a poor country and is about to make his break. And then he picks up his mother's amulet. Turns out to be an amulet with magical powers: a mojo. It turns Roger into a roach. Oops. Bad mojo? What was once Roger now faces a challenge of enormous proportions. A room a human could stride across in seconds is now a vast expanse of potential danger. Can he, as a roach, learn what he needs to know to return to human form by exploring the shabby rooms (among other places) of Eddie's Bar? It's a daunting journey for something as weak and fragile and small as a roach. There are creatures that would gladly turn Roger into an tasty snack. There are sticky patches that could become his final resting place. There is fire and water and electricity. It is a world filled with threats and peril. It is also a world filled with unexpected kindness. The creatures who don't want to put Roger on their menu (a list that includes a slug, ants, a termite queen, a silverfish and a moth) supply him with advice and guidance in the form of surreal oracular rhymes delivered by a woman who looks familiar. Unable to have more than the mildest effect on the world he skitters across, Roger slowly uncovers the truth about himself. And with that truth comes responsibility. Can Roger, on his way to becoming human again, do the right thing? When Bad Mojo was first released, "unique" was the word most often used to describe it. This uniformity of response can be considered a variation of the "Booger Principle" in action: make something disgusting enough and people won't pay a lot of attention to how it actually works. Reviewers were so stunned by the content that few noticed that Bad Mojo's gameplay is essentially a combination of two old standbys: the maze and the warehouse. The player must find safe passage (the maze) and can only push things (the warehouse). Player control begins in the sewer. While there are six pipes leading to various rooms in the building that houses Eddie's Bar, there is only one pipe open at the beginning. 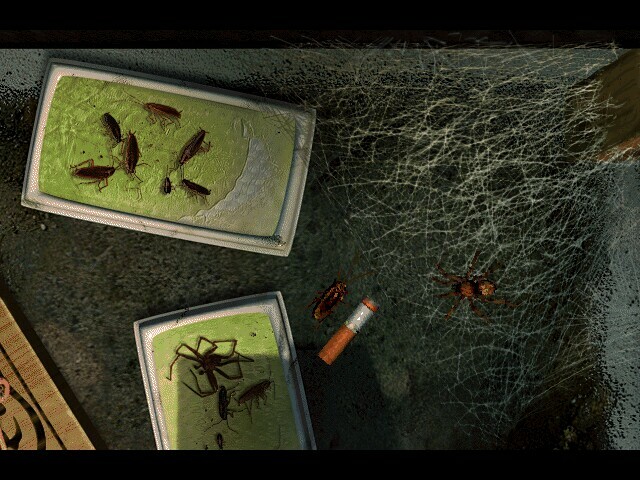 As players discover how to move from room to room within the building, the other pipes open to become a sort of roach rapid transit system. 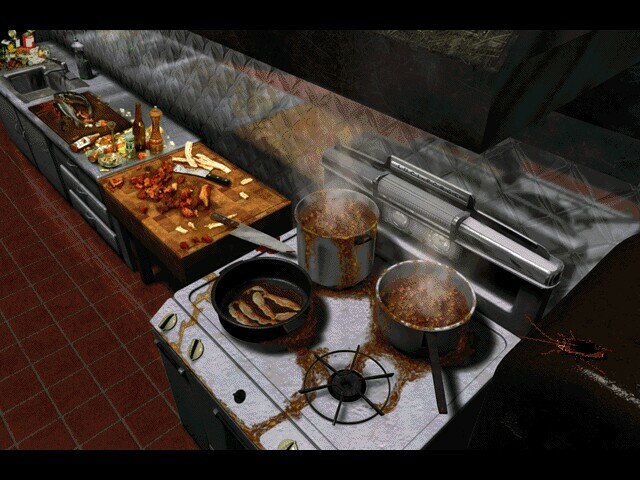 There are points throughout the game when Roger's travels trigger QuickTime clips of Eddie, the bar's owner, going about his lonely life in his rundown establishment. These clips remind us of the gulf that opened between Roger's old and current life following his transformation. As Eddie walks into the bathroom, it's almost impossible not to yell, "Watch out! If you're not careful, you might flatten the odd guy that rents that lousy second floor walk-up of yours!" While the gameplay mechanics are hardly unique and the QuickTime clips as grainy as ever, the richly grimy background visuals and the haunting soundtrack create a compelling, albeit unlikely, venue for a quest. Toss in the highly articulated roach animation (the antennae can be turned on or off in the game preferences) and Bad Mojo remains, for those willing to face it, an unforgettable experience.